Find insider news, interviews, hot trends and even restaurant reviews (the kind you'll enjoy, by industry pros not critics) in Food and Beverage Today. Meet culinary demigod Charlie Trotter and learn what makes this world-class chef and restauranteur so successful, join us as we go behind the scenes in Charleston, South Carolina's best restaurants, plug into the hottest trends in food and beverage, visit with the industry's top marketing masterminds and get all your industry insider news in the May/June issue of Food & Beverage Today. 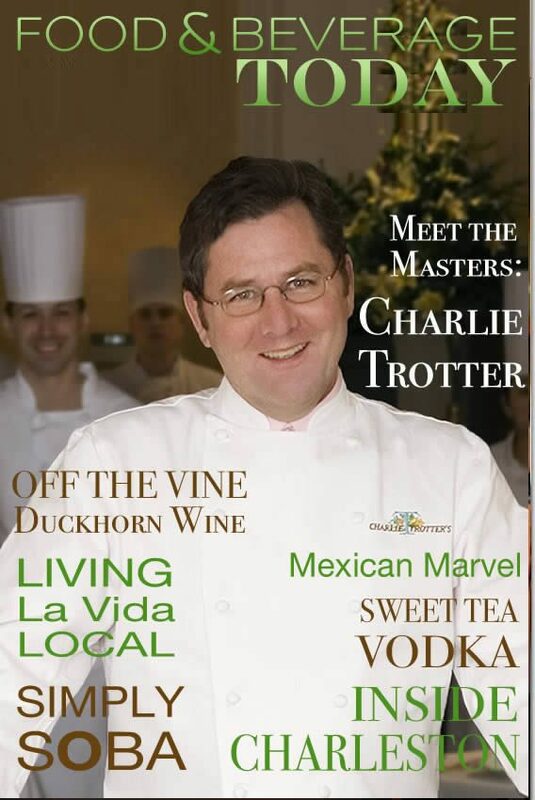 Talent and execution that add up to more than the sum of his parts, join us as we chat with Master Chef Charlie Trotter. Chef shares his love of the craft and his philosophy on food and wine. Join us as we get to know master vintner Dan Duckhorn and find out what's so special about his Duckhorn Wine Company. Nothing less than brilliant, Firefly Vodka carved a niche in this competitive market with their Sweet Tea Vodka. Full of Southern charm and great food, Charleston is a culinary gem. We've picked ten Charleston restaurants not to miss in 2009. Not just a staple of Japanese cuisine, Soba noodles have moved into the mainstream. Where did they come from and what do they mean today? Go global in San Miguel de Allende because San Miguel restaurants are not just a Mexican marvel. Whatever your taste or budget, this expat town caters to it all. We hope you find the magazine to be fun and entertaining while still providing all the food and beverage knowledge and interaction we can. To do that, we need you! This is your site too, so please get involved in it. Send us restaurant or Chef profiles, F & B related articles, what ever you feel relevant. Join the food and beverage underground community, send us your ideas, video clips, or even an original article for us to publish! Enjoy the magazine everyone!